East Marries West is the new musical language developed by Pandit Shubhendra Rao and Saskia Rao. Its soul is open, its mind secure in the Indian Classical tradition. .Pt. Shubhendra Rao is one of India's leading Sitar players and a protégé of sitar Maestro Ravi Shankar. 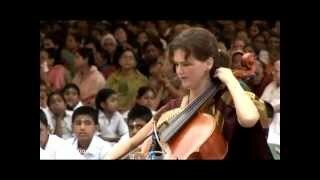 Saskia has incorporated the cello to Indian music and created a new instrument: the Indian Cello. A student of Shubhendra made this short film. It shows a few excerpts of their concerts around the world and a short interview with the artists. For more details on this cross-cultural artist couple, check out their websites: www.shubhendrarao.com and www.saskiarao.com.